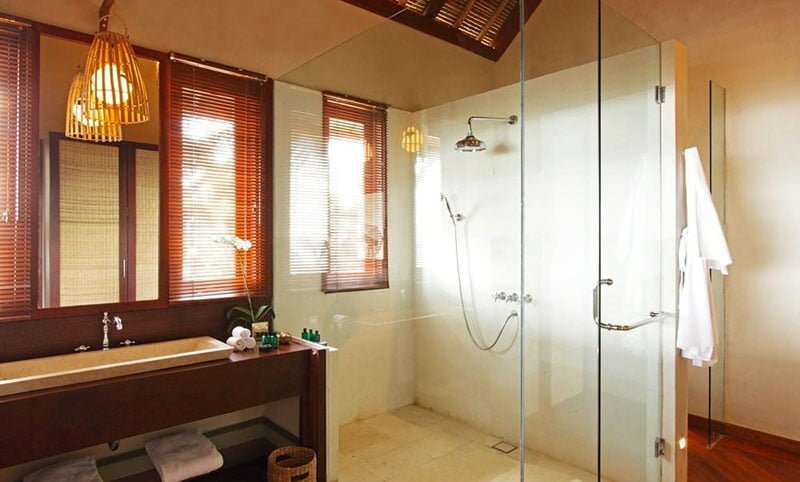 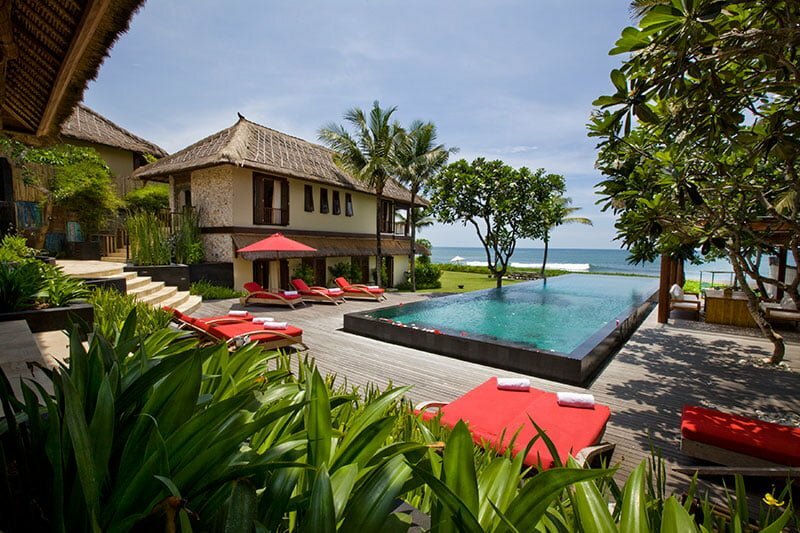 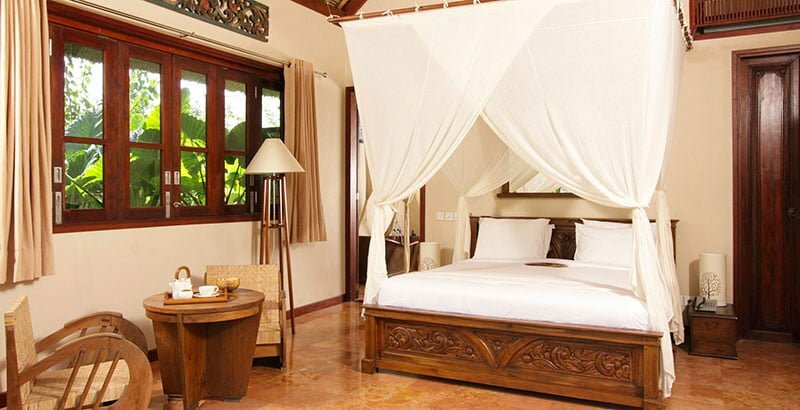 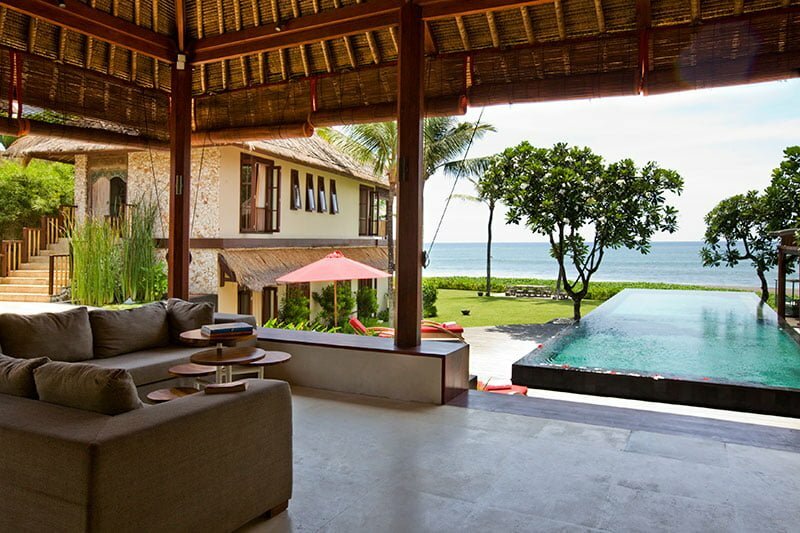 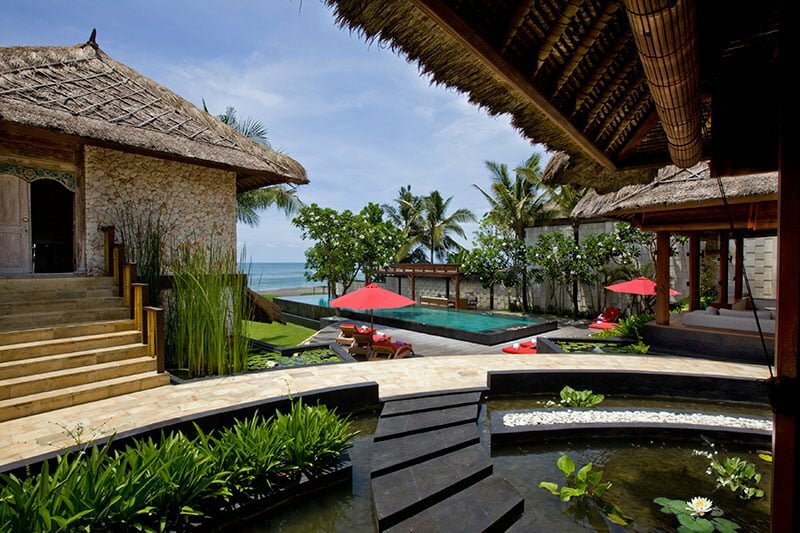 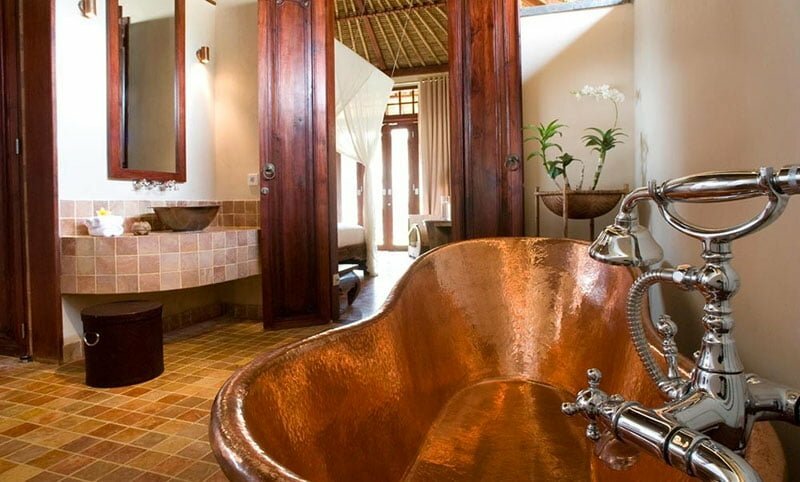 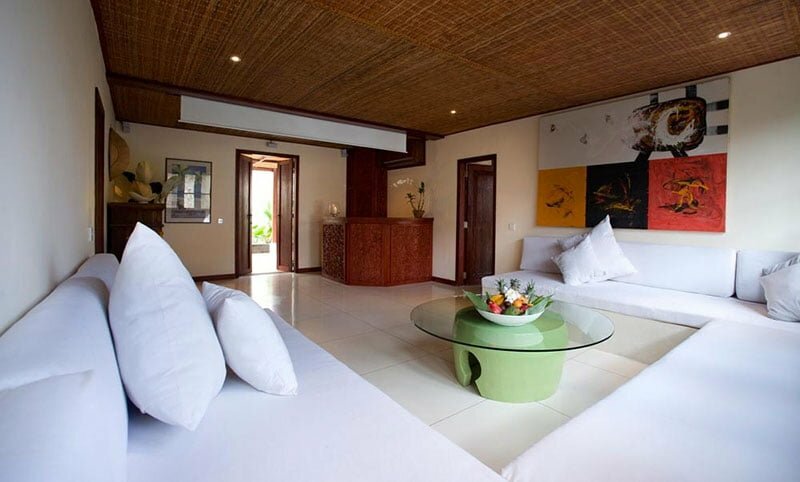 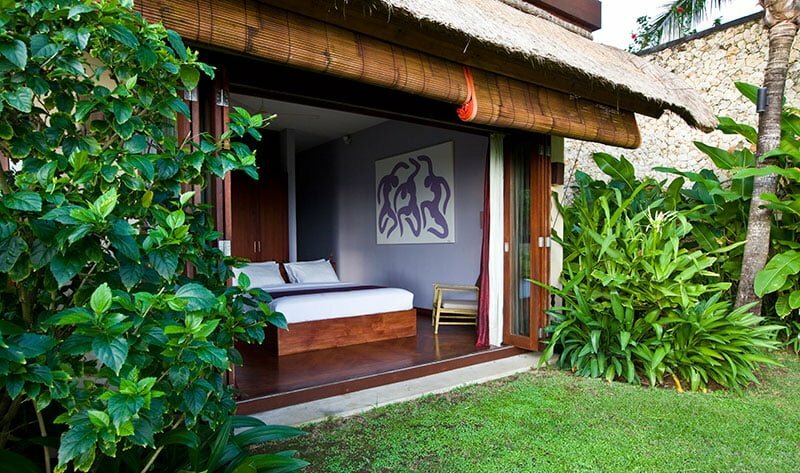 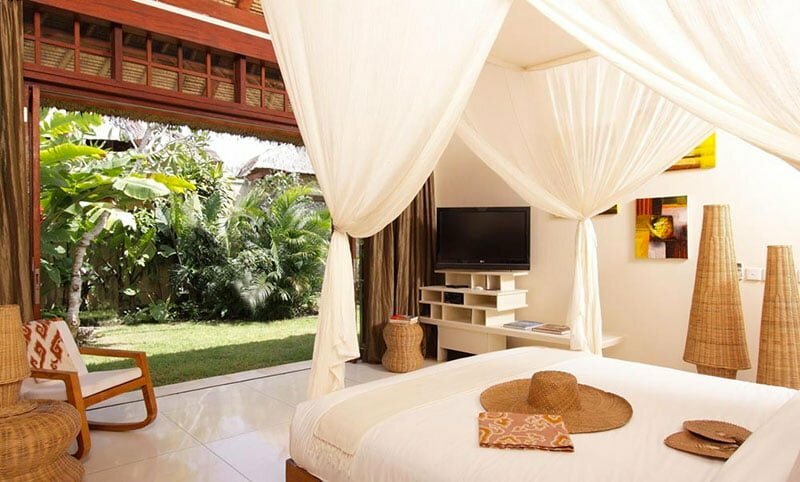 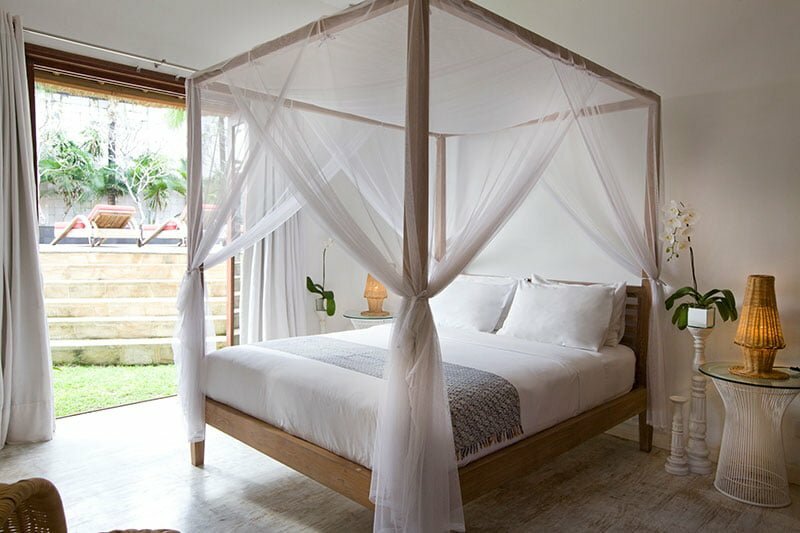 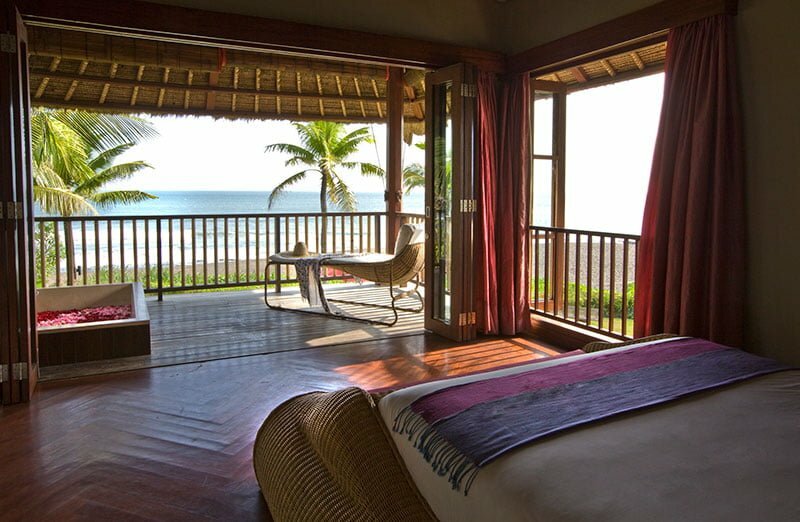 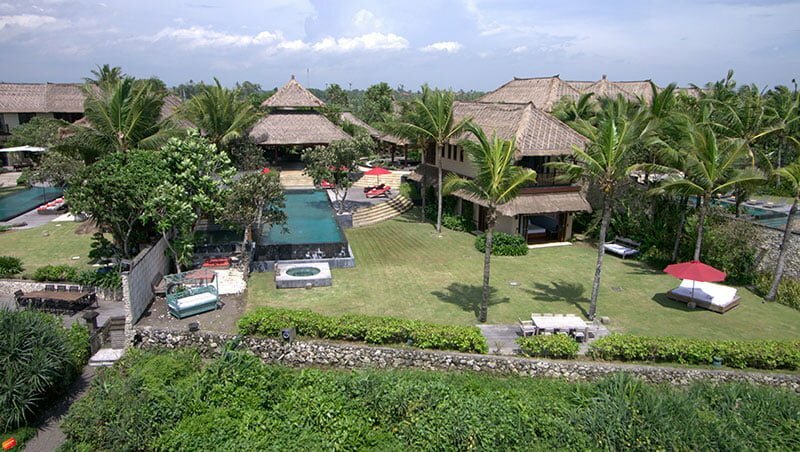 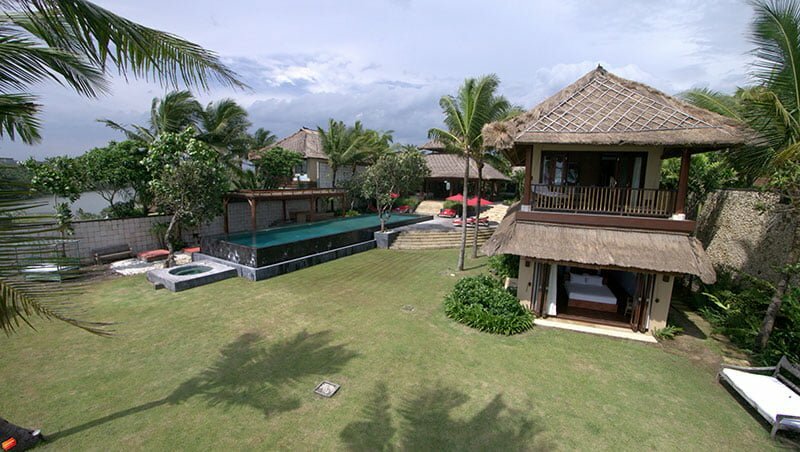 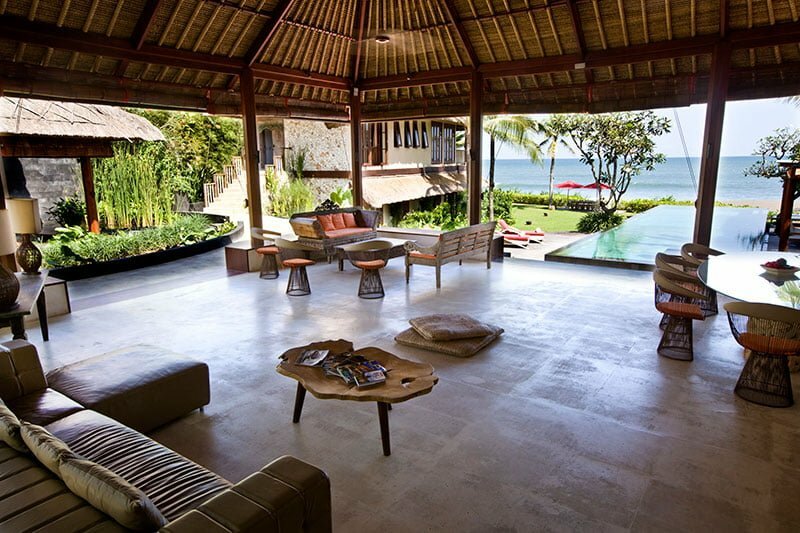 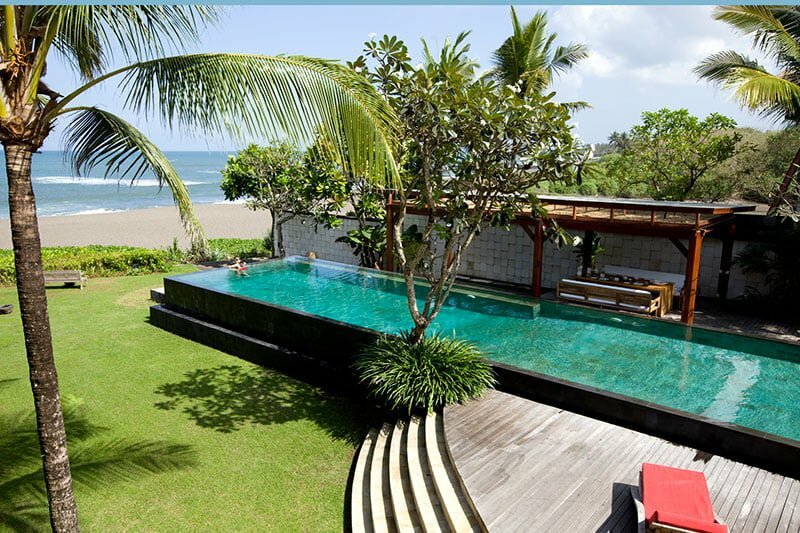 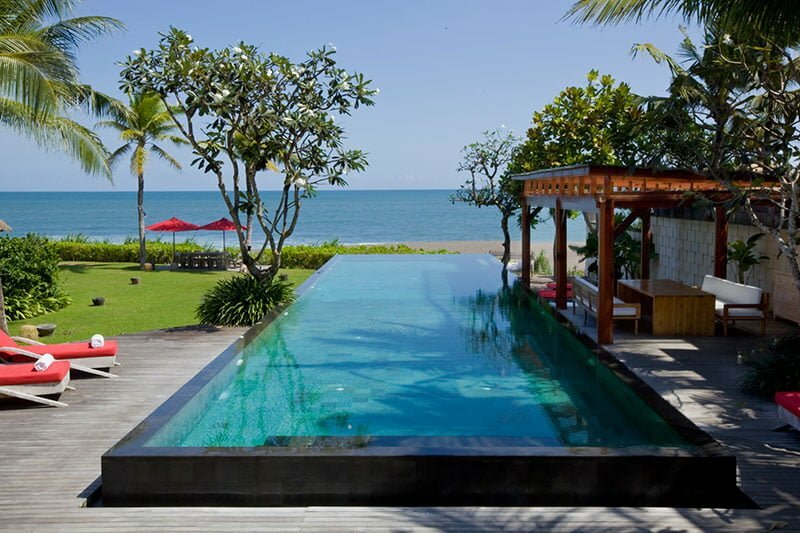 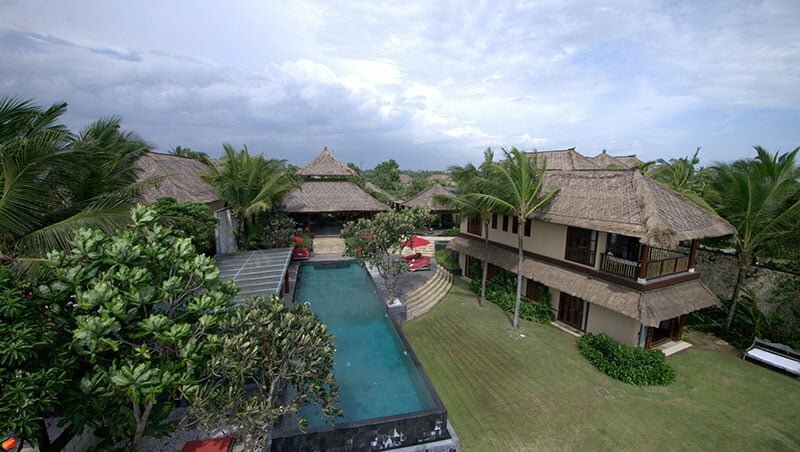 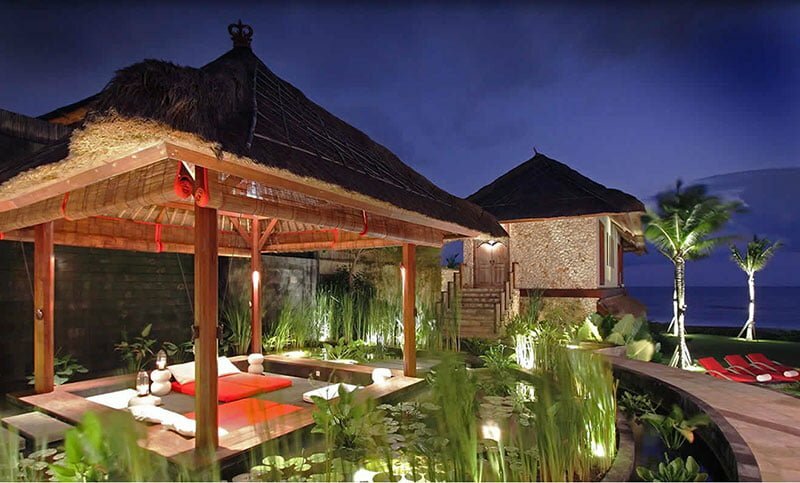 Villa Sound of the Sea is one of the five beautiful villas that make up the Pantai Lima complex in Canggu. 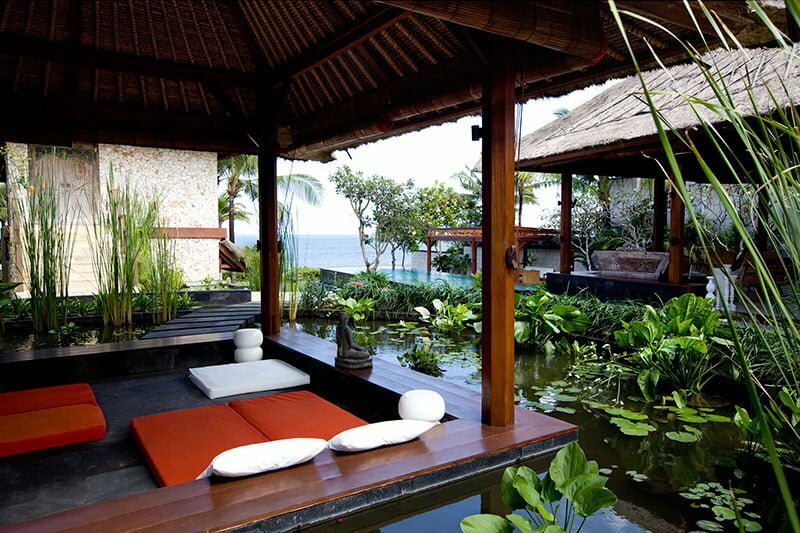 As from the moniker, this villa is a space of relaxation just a few feet from the ocean – and the setting is as picturesque as it gets. 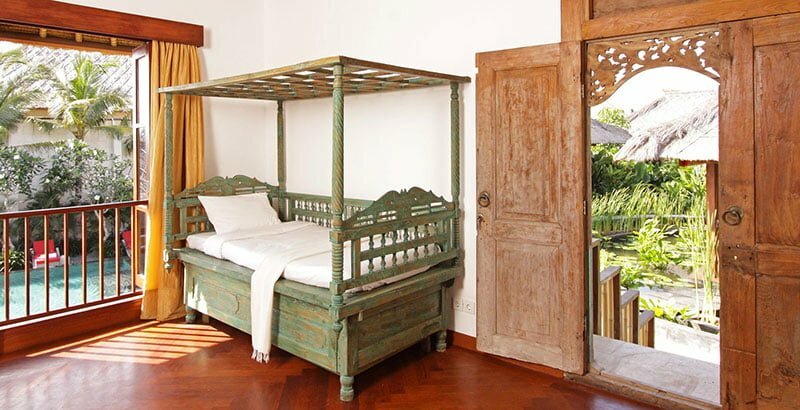 With 6 comfortable bedrooms, a thriving garden, and top-notch facilities, this residence is a dream destination for families, friends, and lovers looking for a private holiday. 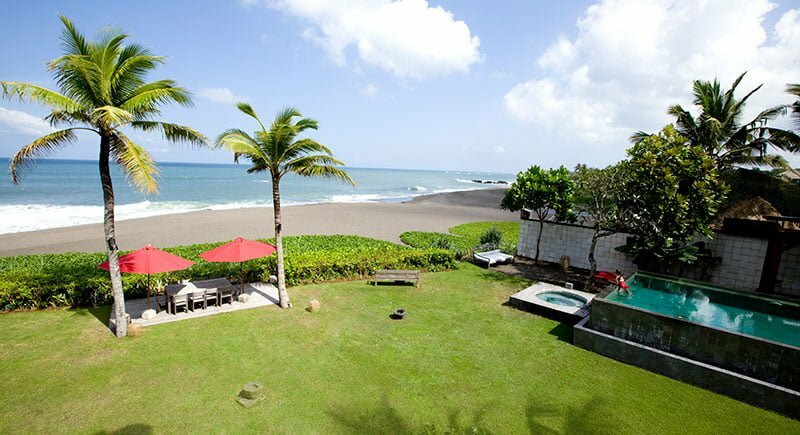 Villa Sound of the Sea is in Pererenan, which offers guests a rare and peaceful escape. 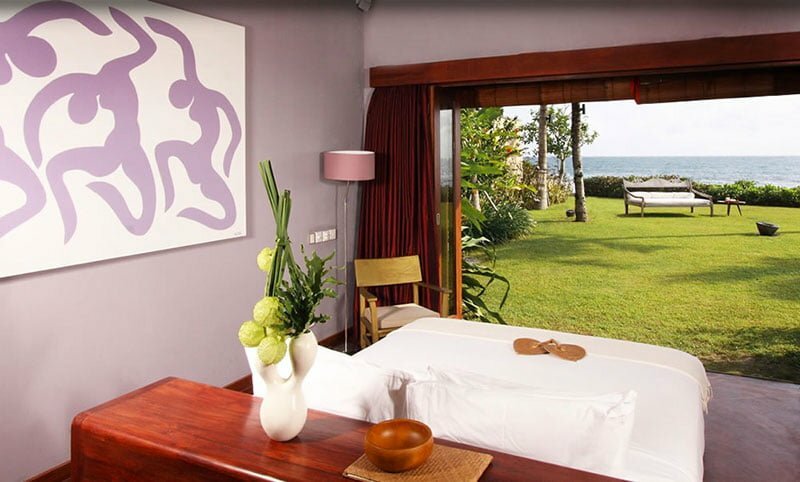 The famous Echo beach throbs with café and bars such as Old Man- it is just a few minutes away from the villa. 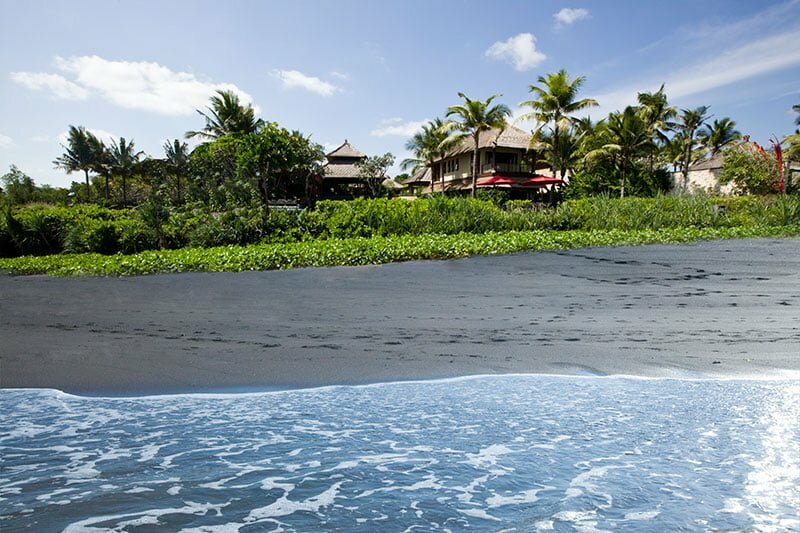 Tanah Lot temple is another must-see for the villa residents. 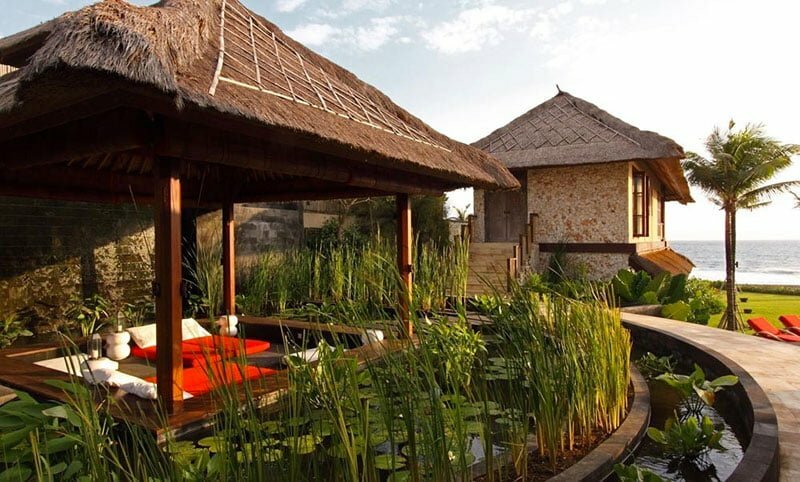 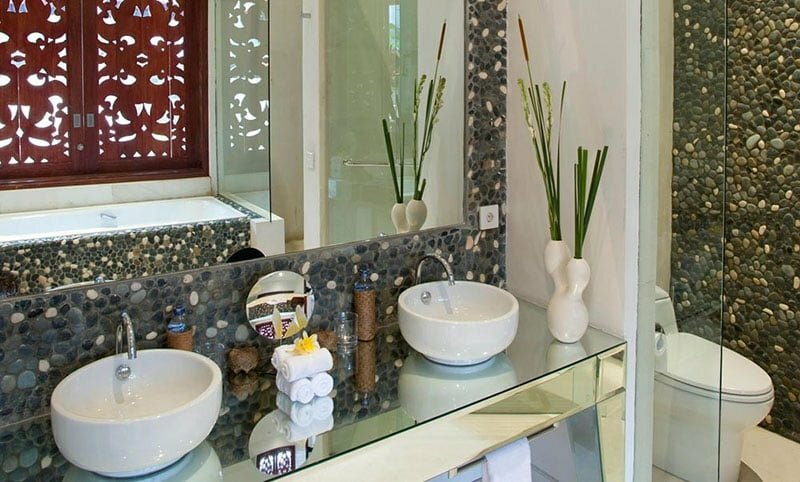 The outdoors is elegant with lush gardens, lotus ponds, and hand-carved statues. 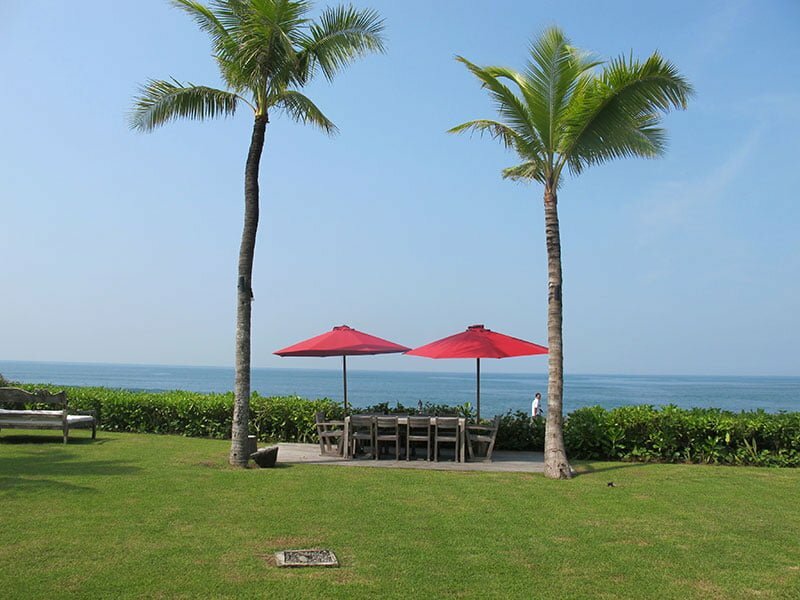 The blooming grass backyard stretches out all the way to the seashore. 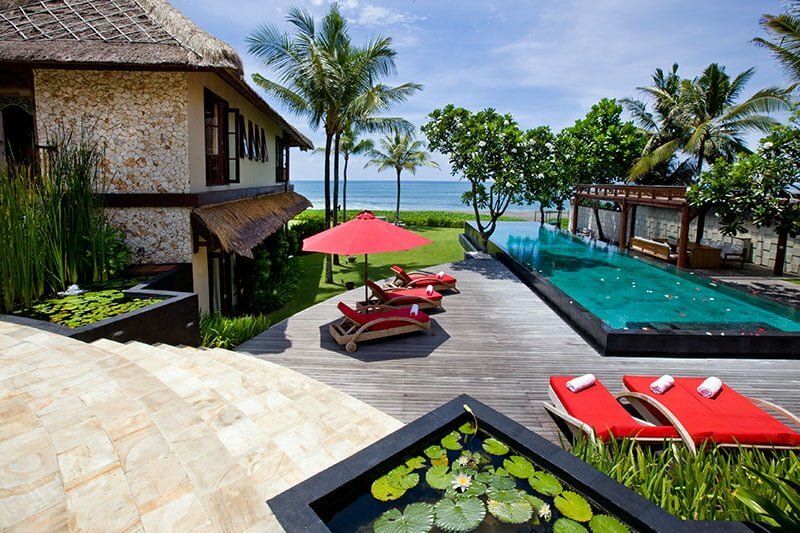 In the lawns lie the jacuzzi and a baby pool. 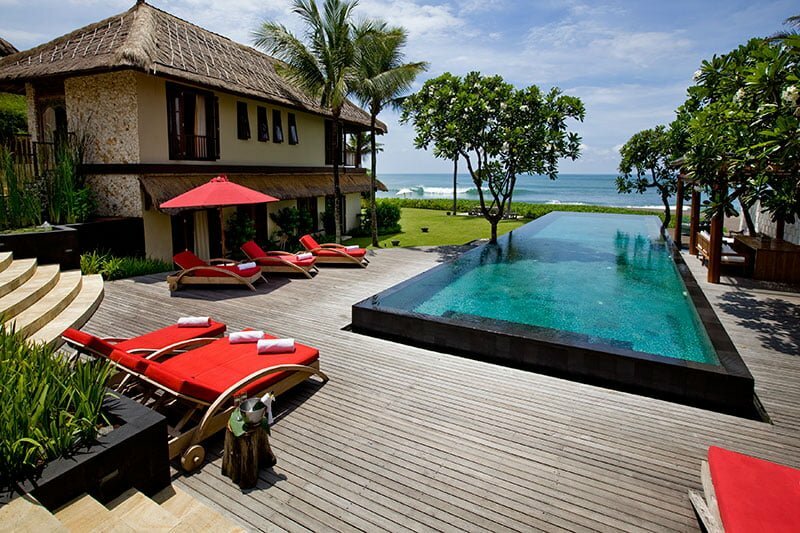 Around the pool are sun loungers where you can lie back for a tan. 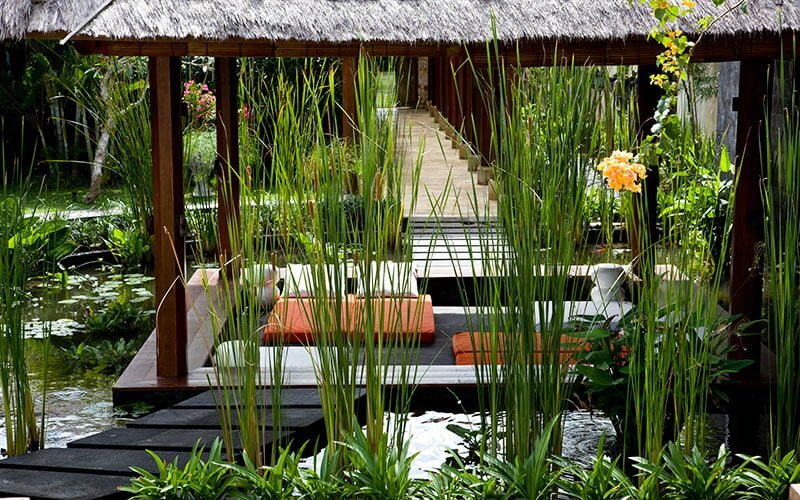 The outside space also features a spa pavilion. 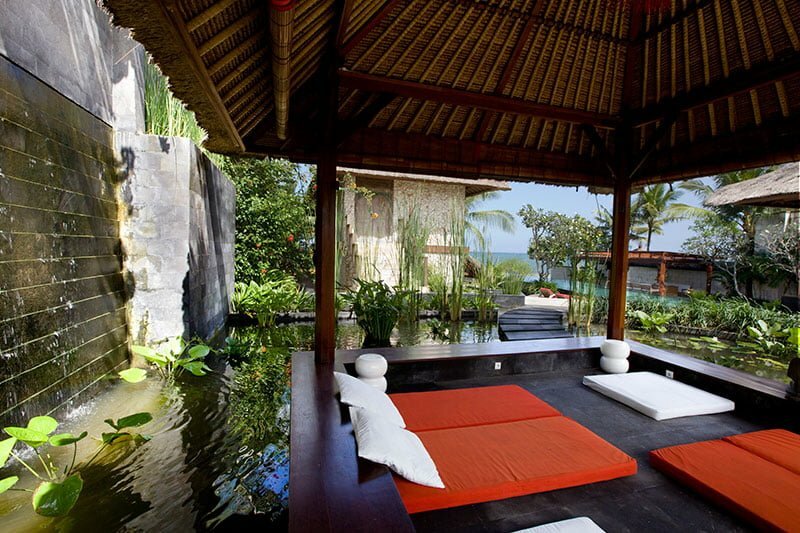 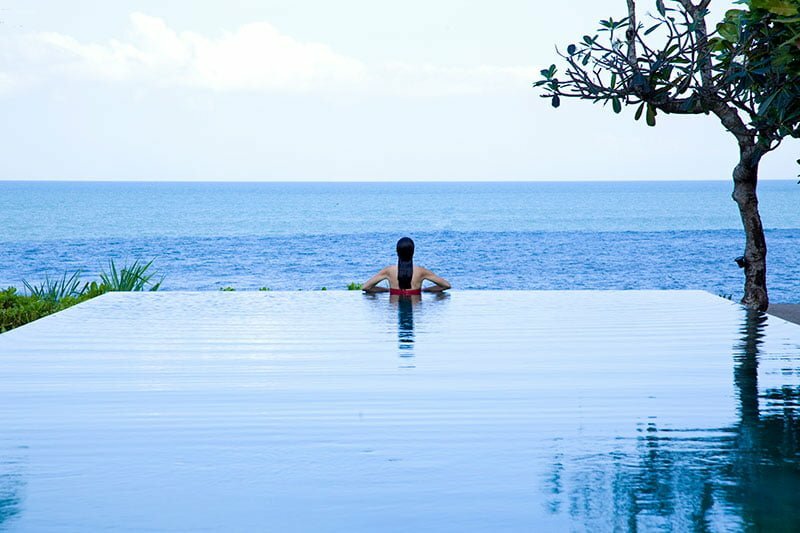 You could relish a back rub here as the sounds of ocean rise and fall serene you. 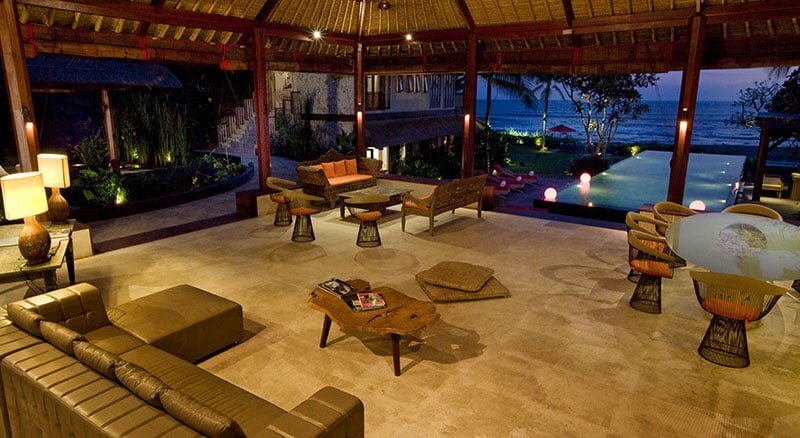 When the night comes, you can plan for a barbeque party at the beach together with your friends. 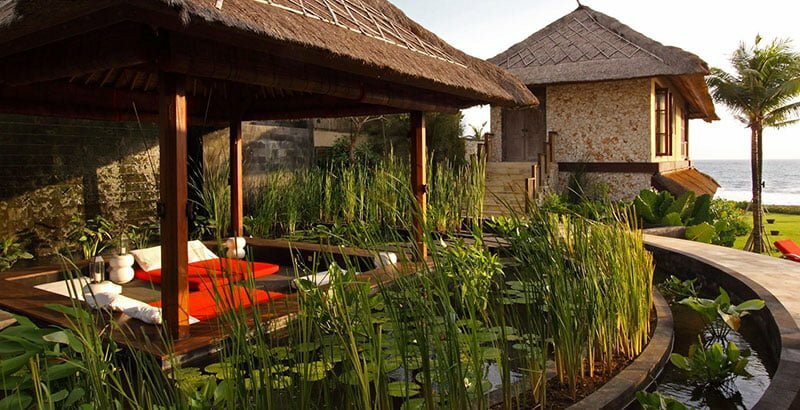 The living pavilion is adjacent to the garden area, and it features the traditional alang-alang roofs. 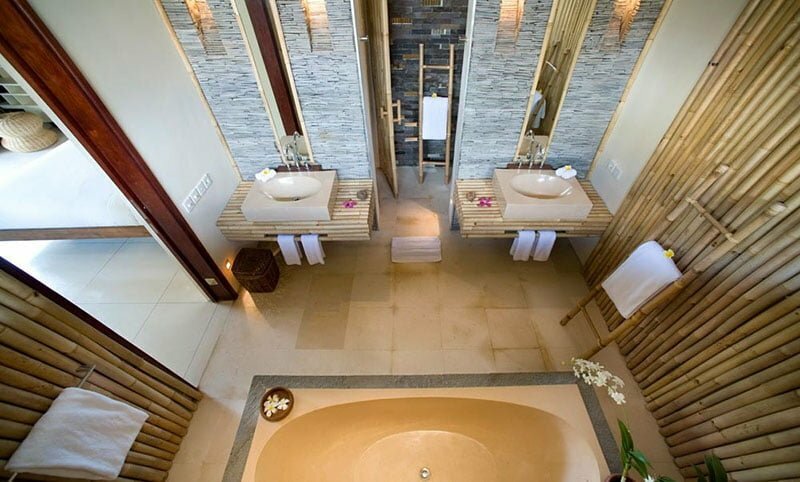 Crystal chandeliers hang from the ceiling, beautifully lighting the living space in the evenings. 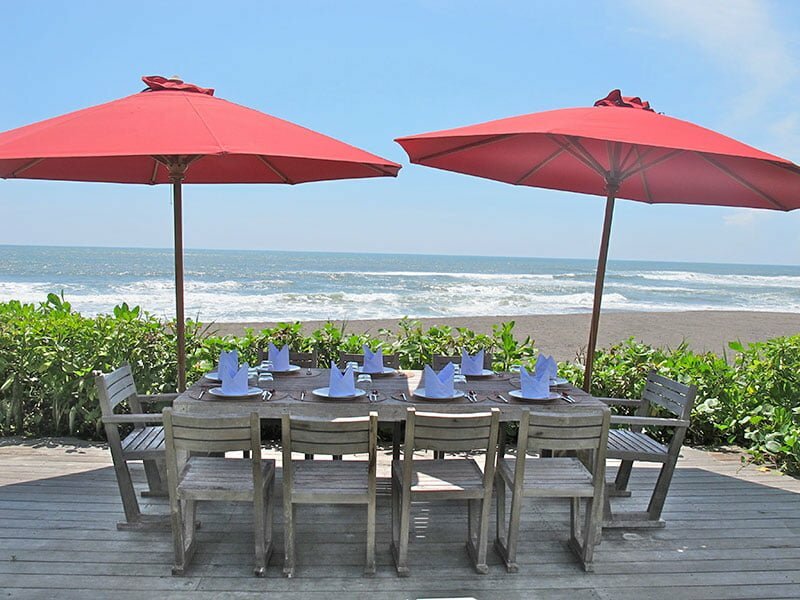 Dinnertimes at Villa Sound of the Sea are memorable. 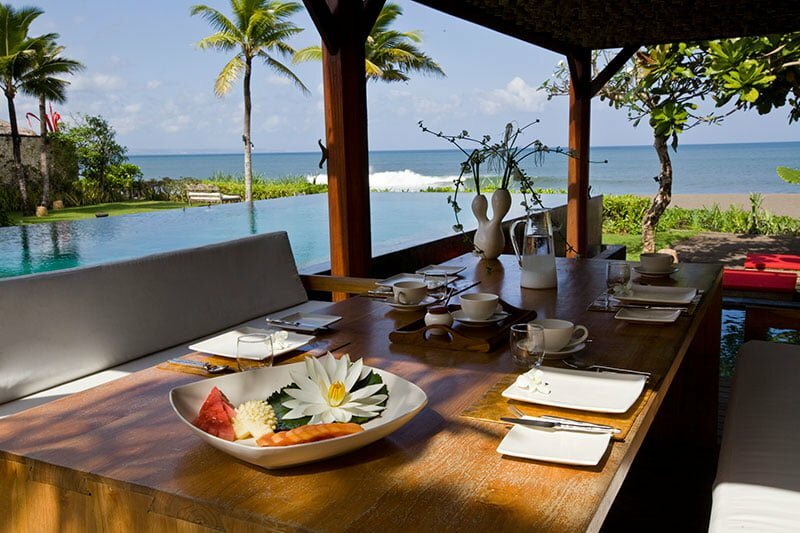 An experienced chef prepares dishes synonymous with the island and your favorites from the western world. 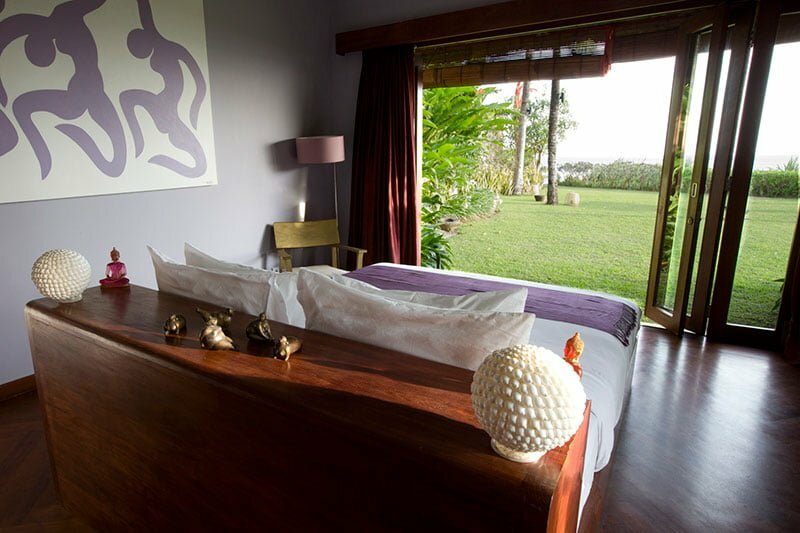 From the larger coaches of the living room, the wooden seats at the bar or the dining table in the eating area you will catch splendid views of the garden and the beach. 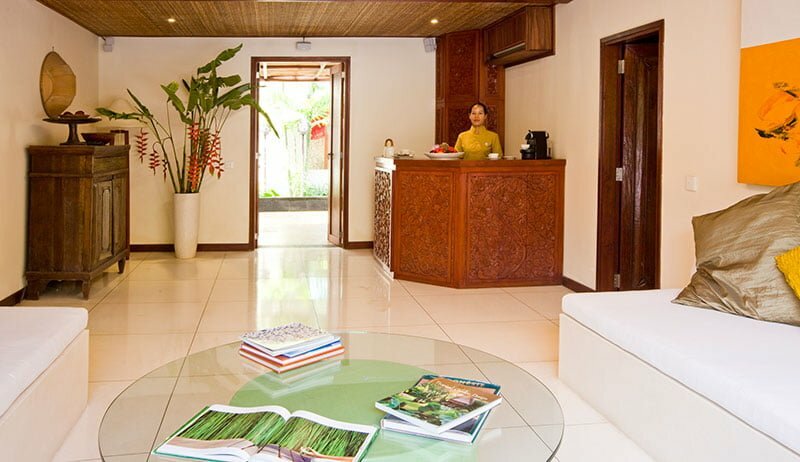 There is a team of friendly staff ready to take care of your needs. 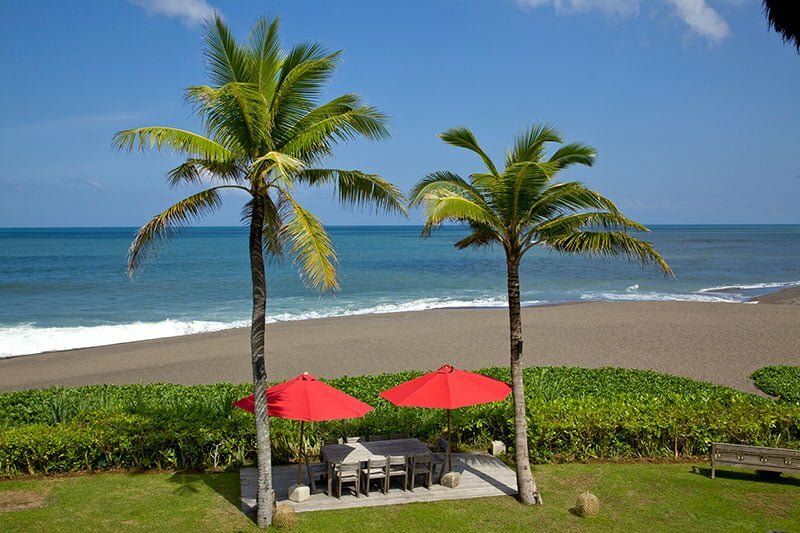 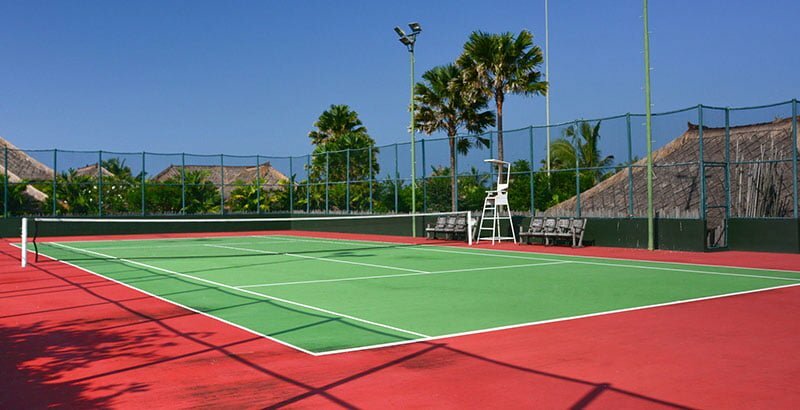 You will also have a chauffeur-driven the car for your exploits in the southern part of the island.